Use this wall outlet strap with the On-Q 6-port Phone/Data Module to access phone and data services in one room of your home. It installs in a standard single-gang electrical box and connects to the Phone/Data Module via a single pull of CAT-5e cable. 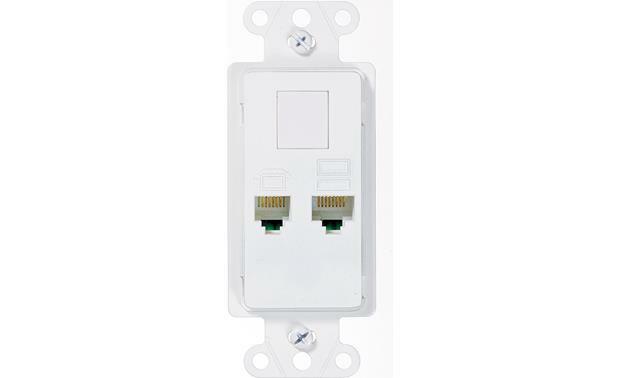 Standard 1-gang junction box and Decora-style wall plate required for installation. Product Overview: The On-Q white Phone/Data Wall outlet strap provides phone distribution, data distribution, and has option for a keystone insert for another type of connection. The strap fits into a single gang box, and can be used with a Decora wall plate. Wire Connection: The Phone/Data wall outlet strap can accept a Cat 5e cable, connected via an 8-conductor 110 style punchdown connector on the rear of the strap. Optional Keystone Insert: This outlet strap has a single Keystone opening for any of the optional On-Q Keystone inserts to give you another connection. You can select another RJ45, an F-type connector, speaker terminal, binding post, or an RCA jack in a variety of colors. Searches related to the On-Q Phone/Data Strap .